Toy Story 4 Trailer Goes from Calm to Chaos with New Character | Nerd Much? Disney and Pixar have finally let us behind the curtain and dropped the first Toy Story 4 trailer today. It’s just a teaser, so it doesn’t show much. But it does introduce us to the character that could throw a wrench into the group – or should I say fork? The first Toy Story 4 trailer is just a clip of the core group holding hands and dancing in a circle. We see Woody, Buzz, Jessie, Mr. Potato Head, Mrs. Potato Head, Rex, Hamm, one of the Pizza Planet aliens, and Slink. 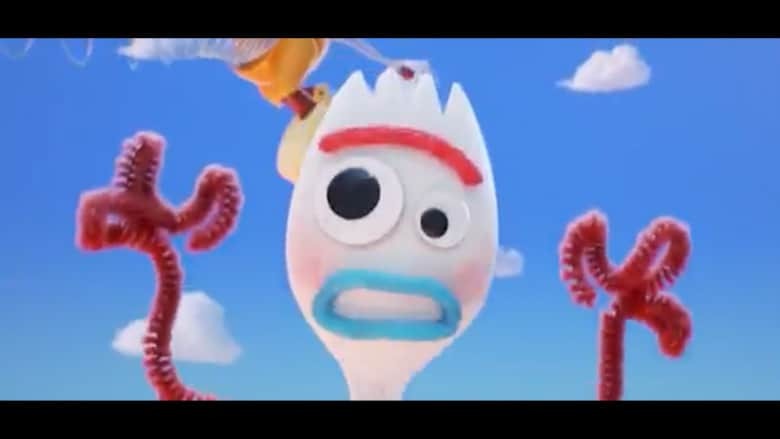 And then a new character is introduced, one unlike any we’ve seen before – Forky. As soon as Forky is seen, the character begins immediately freaking out and shouts “I don’t belong here!” He yanks his hand from Slink’s tail and Woody’s hand and begins an all-out meltdown. The new character singlehandedly kills the whole Kumbaya feel of the group and send it into complete disarray. Early word was that Toy Story 4 would be a romantic comedy with the story revolving around Woody’s relationship with Bo Peep. The character was ominously missing from Toy Story 3, and in 4, it was said that Woody and Buzz would be venturing out to find her. What’s interesting about Forky is that, just as he says, he isn’t a “toy” per se. The character looks like a craft that Bonnie may have created herself. Forky is comprised of a plastic spork for his body and head, googly eyes, and pipe cleaners for his arms and hands. This then brings up an interesting question in this universe – what exactly constitutes a toy that walk and talk when we aren’t around? This question could then tie in nicely with the character Bo Peep. She isn’t technically a toy either, but instead a porcelain doll that was attached to Molly’s bedside lamp. We’ll find out how it’s all connected next summer.